Newsletter and Sale – so many reasons to celebrate summer! Swim to our 25% off cupcake pick sale! Summer is here – which means bbqs, pool parties, weddings – all reasons to celebrate with cupcakes and stylish, fun and clever cupcake picks! Browse our select cupcake picks on sale HERE. Discount automatically applied at checkout. We are also happy to announce to our “hot off the press” Summer Newsletter with fun decorating ideas and new products to inspire every baker. View this online only newsletter HERE. New this summer is our fish bowl cookie cutter! 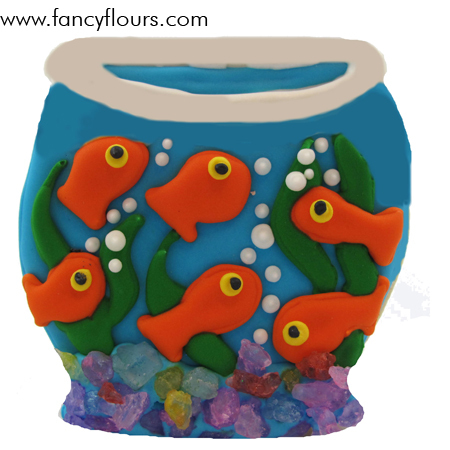 Create your own aquarium with this fun cutter, quins and bright royal icing colors. View the how-to recipe HERE. Enjoy the sunshine Fancy Friends! This entry was posted in Announcements, Cookie Recipes & Ideas, Cupcake Recipes & Ideas and tagged cookie, cupcake pick, Cupcake Recipes & Ideas, fancyflours, fish, fish bowl, newsletter, sale, sugar cookie by Fancy Flours. Bookmark the permalink.